I am a little surprised by my reaction to tonight’s events. I mean, I have not been able to get out a blog post (started many, never have enough time to finish – maybe I’ll finally get out my summer summary or back to school posts by December) in months. I certainly do not have the time to be writing this one, especially considering that it is after midnight on a work night (my normal bedtime). I just had to write more than a quick Facebook message about this one. 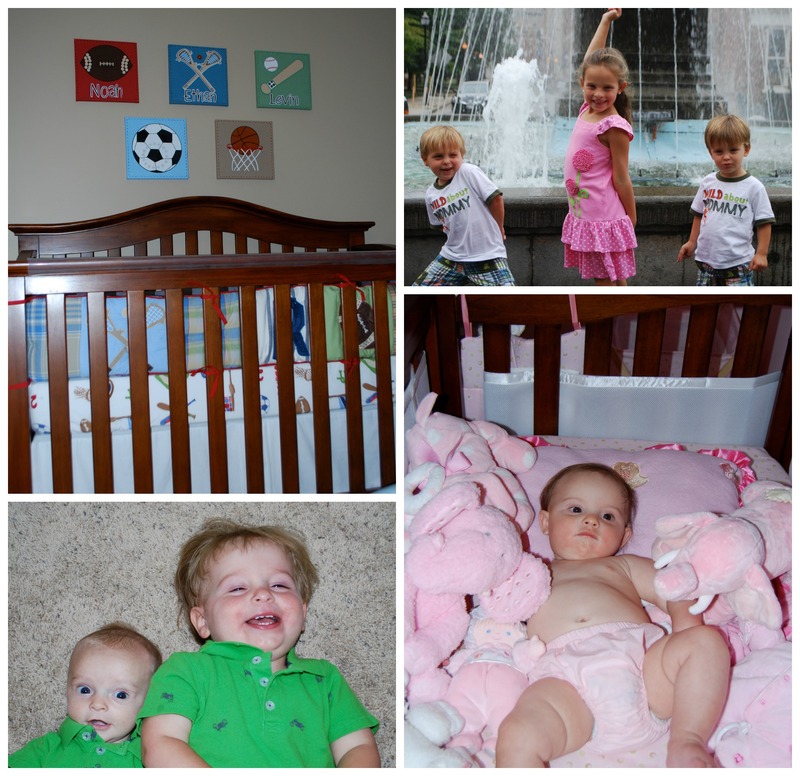 We took down the crib tonight – our last crib – ever. Noah has been using his crib as a toddler bed for the past 6 months or so, with the front rail removed to allow him to get in and out on his own. He has basically been “out of the crib” for a while now, but physically taking apart the crib symbolized something bigger. I just can’t believe that my babies are growing up so fast. Time has moved especially quickly this year. I don’t know if it is being back at work full-time and being busy and overwhelmed all the time, or if it is that the kids are really just growing by leaps and bounds, but it has been an eventful year. Isabella lost her first tooth a few months ago, and has lost another one since then. I remember losing my first tooth like it was yesterday, so it is hard for me to believe that I have a kid old enough to lose her first tooth. She is growing into a smart, talented young lady. She joined the swim team and is taking piano lessons – such big girl activities. Jacob is talking so much better now. He no longer takes naps and is about 80% potty trained (yep, that is right, not all the way there yet – 9 months later). He looks and acts like such a big boy, and I just glow with pride when I think about how far he has come in such a relatively short amount of time. Noah, our baby, is talking up a storm and recently got potty trained. He no longer cries when we drop him off at preschool, and learns many new things so quickly. Now that the crib is out of his room, he’ll be moving into a big boy bed. Getting rid of the diapers, the crib, and much of my baby stuff really drives home the message that we no longer have babies in our house. It is not that I want any more babies or that I want to hold my kids back from growth and development, but I just wish I could slow the pace down a bit – savor every minute of this time with my little ones. I have been trying to savor the little moments with my kids more. Sometimes I find myself almost drinking them in, memorizing their smiles, their laughter, the expressions, and the way they feel and smell in my arms. Every night when I rock Noah in his chair – when he asks for one more book, or song, or story – I am just trying to not get frustrated or derailed by the to-do list in my head and just savor the precious time I have with my last baby. My nature is to look forward, plan for tomorrow, get through each day the best that I can. I certainly can’t change the actual speed of time or the number of hours in a day or days in a week (trust me, I have tried and wished hard for this). I can’t change that part of who I am and how I operate, but I can try to control my pace with the kids. I need to remember to slow down when I walk in the door after work (easier said than done). I need to play when I am asked to play and snuggle when snuggling is requested. There may come a time when playing and snuggling aren’t the main two requests I get when I come home to my kids. I know I need to enjoy it while it lasts, because much like diapers and cribs, the snuggles and child’s play are eventually outgrown too. So true, Jess! Love your line about drinking them in. You’re a great Mom with such big kids now! 🙂 hugs ! Thanks so much Caitlin! You inspire me too and help me stay sane.